Blowout Sale! 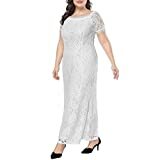 Up to 66% off on Plus-Size at SCRHI. Top brands include Nemidor, Lalagen, Chicwe, wearella, Daci, Prior Jms, KSHUN, IN'VOLAND, ADOME, Sarahbridal, FUSENFENG, ESPRLIA, ShaperQueen, Avidlove, Jose Pally, & Just Love. Hurry! Limited time offers. Offers valid only while supplies last.